Congratulations to the entire membership and leadership of KOCPA on achieving magnet status for the Kaiser Anaheim Medical Center. 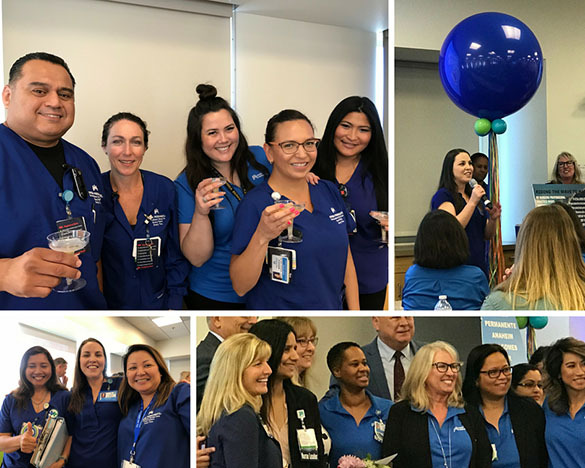 After months of preparation led by the Anaheim RNs, the national magnet committee called into a gathering of Kaiser Anaheim employees and management at 8:30 AM last Thursday, July 26, to make the announcement. Anaheim is the second Kaiser hospital to achieve magnet status, the eleventh in Orange County and the 35th in California. The other Kaiser magnet facility is Irvine, designated last year, which means both KOCPA hospitals are now magnet. Anaheim Hospital President Leslie Patin, RN, Med/Surg addressed the celebratory gathering, along with the hospital’s CNE and other management figures. Jettie Deden-Castillo, NP, UNAC/UHCP Treasurer also attended the celebration. This is a huge achievement for all our Kaiser Anaheim and KOCPA members.